For a limited time, receive Double Cash Back from ShoppingBoss when you purchase AMC digital gift cards. Remember, gift cards do not expire so plan ahead and cash in on this bonus cash! This offer is valid July 2nd - July 8th. 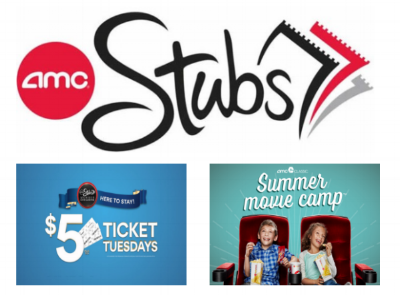 Keep your summer budget in balance by taking advantage of the many benefits AMC Stubs offers. Take the kiddos to the movies for just $4 during their Summer Movie Camp. Enjoy a movie on Tuesdays for just $5. Click the photos above for more info on these special offers from AMC. Why not make it dinner and a movie and earn even more cash back! Dine in or takeout; pay with a digital gift card to earn an average of 6% cash back from over 100 participating restaurants. Treat yourself this Summer and earn cash!